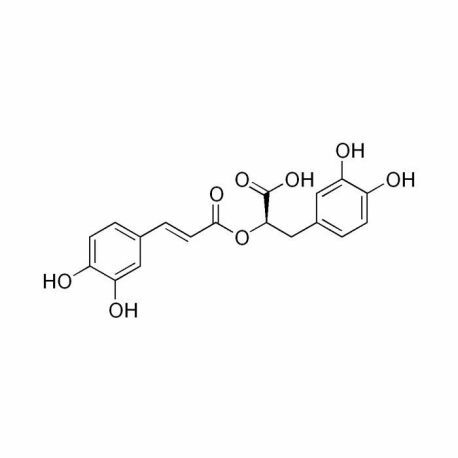 Rosmarinic acid has antioxidant, anti-inflammatory (ie., artherosclerosis, rheumatoid arthritis),anti-allergenic (ie., allergic asthma) and antimicrobial activities. Through inhibition of indoleamine-2,3-dioxygenase (IDO) RA may as well have notable affects on cognition, focus, mood, especially as it may be able to exert remediation of "brain fog" and related cognitive disturbances. 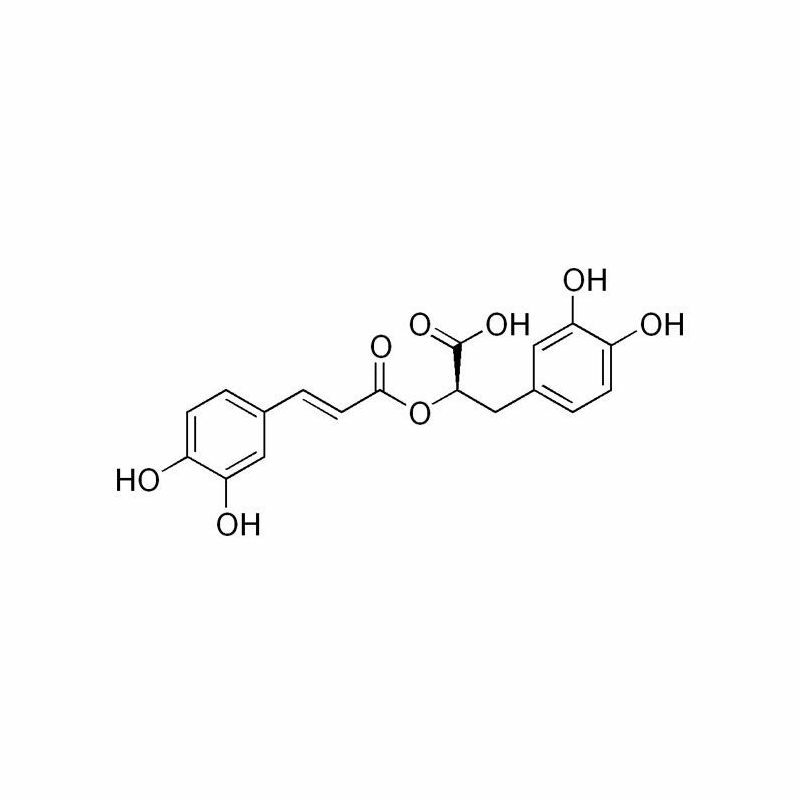 Rosmarinic acid has antioxidant, anti-inflammatory (ie., artherosclerosis, rheumatoid arthritis),anti-allergenic (ie., allergic asthma) and antimicrobial activities. 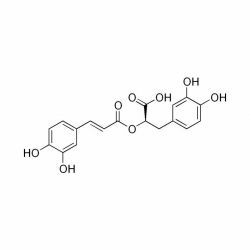 Notably, the antioxidant activity of rosmarinic acid is stronger than that of vitamin E.
A study by Youn J, et al. (Journal of Rheumatology, June 2003) demonstrated that rosmarinic acid suppressed synovitis in mice and that it may be beneficial for the treatment of rheumatoid arthritis. Unlike antihistamines, rosmarinic acid prevents the activation of immune responder cells, which cause swelling and fluid formation. Rosmarinic acid acts as a GABA transaminase inhibitor, more specifically upon 4-aminobutyrate transaminase, and demonstrates anxiolytic potentials. Rosmarinic acid also inhibits the expression of indoleamine-2,3-dioxygenase (IDO) via its cyclooxygenase inhibiting properties. Indoleamine 2,3-dioxygenase is the first and rate-limiting enzyme of tryptophan catabolism through the kynurenine pathway, thus causing depletion of tryptophan and serotonin production. IDO is an immune checkpointmolecule in the sense that it is an immunomodulatory enzyme produced by some alternatively activated macrophasgesand other immunoregulatory cells (also used as an immune subversion strategy by many tumors). Inhibition of indoleamine 2,3-dioxygenase exerts neuroprotective properties by suppressing kyurenineneurotoxic metabolites such as quinolinic acid, 3-hydroxy-kynurenine and nitric oxide synthase. Importantly, such inhibition may as well have notable affects on cognition, focus, mood, and related beneficial parameters, especially as it may be able to exert remediation of "brain fog" and related cognitive disturbances. Dosages for alleviation of cognitive "brain fog" oriented syndromes, as well as for other conditions that may apply, are seen to be trialed at 100mg RA (as 500mg of 20% RA extract) taken two to three times per day with meals. A small percentage of individuals are expected to potentially require 1000mg RA 20% (200mg RA) taken two to three times per day with meals.